The pH measures the acidity or alkalinity of water, with the value 7 representing neutrality. 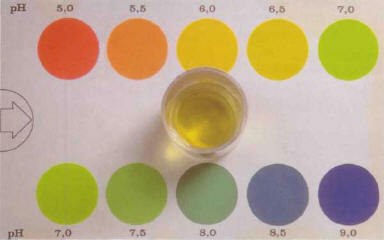 Below this level the water is acid, and above it the water is alkaline (or basic). Categorizing water as acid does not mean that it contains dangerous acids. In forest streams and rivers the water accumulates with acid organic fluid (humic acid) derived from the decomposition of plants (humus), producing an amber yellow color. 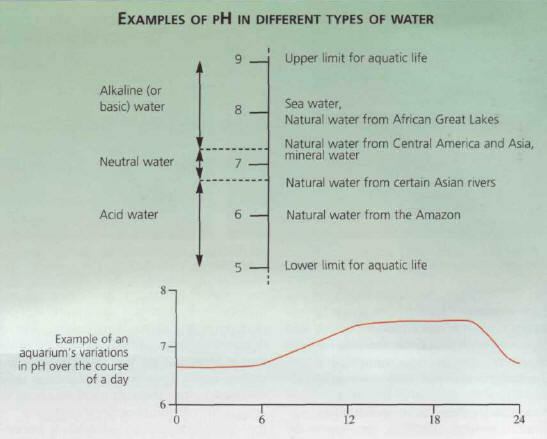 Generally speaking, aquatic life can exist only between pH 5 and 9. These extreme values are rarely found in an aquarium, where the pH ranges from 6 to 8 according to the type of water, and usually lies between 6.5 and 7.5. In aquariums, the term acid water corresponds to a pH between 6 and 6.8, while alkaline water refers to one between 7.2 and 8, and a pH between 6.8 and 7.2 is considered neutral. Variations in pH are mainly the result of biological activity: the carbon dioxide produced by living beings acidifies the water at night and the pH goes down slightly. Once the carbon dioxide has been absorbed by the plants during the day the pH goes up again. Although slight variations are therefore normal, more extreme changes can be a warning signal. The pH is a good indicator of an aquarium's equilibrium, and it should therefore be measured regularly. A colored marker dipped into a sample of water is used to compare the color obtained with the scale provided. Electronic meters are also now available for testing pH values. The pH of domestic water may not always be particularly suited to the fish you have chosen. Furthermore, when an aquarium is in use the pH can rise and fall, slowly but very regularly. There are some aquarium products on the market that enable adjustments to be made to the pH, but there are other ways of modifying it. the water from the aquarium can be filtered over peat, which will release certain acids. The amount of peat needed to maintain a specific pH value must be found through trial and error, with regular measurements of the pH. the water can be filtered over calcareous material, rock, or oyster shells broken into little pieces. In this case, the hardness also increases (see below). ЮЖНО-КУРИЛЬСК , поселок городского типа в Российской Федерации, Сахалинская обл., на о. Кунашир (Курильские о-ва), на берегу Южно-Курильского прол. 6,2 тыс. жителей (1993). Рыбная промышленность.